Do you have your barrel and receiver set up to run flawlessly in your AR-style rifle? Most likely yes, but there are certain configurations that just won’t do. 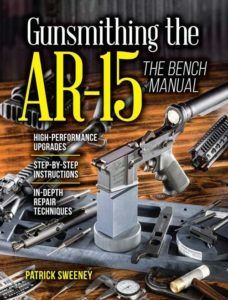 Get a handle on your tactical rifle with Gunsmithing the AR-15 — The Bench Manual. This takes a bit of explanation. The original design of feed ramps were cut in the barrel extension from the magazine to the barrel. The front face of the receiver is simply a flat wall. Each round, as it strips forward out of the magazine, cams up so the tip strikes the feed ramp, and not the receiver wall. In the semi-auto rifle, and in the early M16A1s, there was no problem. Everything worked as designed. By the late 1980s, however, there was a problem. The government had switched from the M193 to the M885 round. Colt was developing the M4. What Colt found was, when using the M855 round in the M4 on full-auto fire, the feeding became less consistent, and sometimes the tip of a round would strike the receiver wall. That would bring things to a halt, and also stub the bullet back into its case. The only one that is problematic is the last one, AR barrel with a M4 receiver. AR/AR is the original, and it works. M4/AR has the feed ramps steeper, but they do not overhang the receiver ramps (there aren’t any) and no problem. M4/M4 is clearly correct. An AR barrel in a M4 receiver, however, has steeper feed ramps cut into the receiver wall, with less-steep ramps cut into the barrel extension. (We’ll overlook for the moment that the front sight is probably also a problem, but that’s a different chapter.) The result is that the ramps in the M4 receiver have an overhang from the barrel extension of the AR barrel. A bullet can catch in there and stop the cycle. No, this is not theoretical. I saw it in a recent class, and we had to correct it. Before we proceed, you must be familiar with the front sight height considerations between AR carbine and M4 barrels. If your rifle is correctly zeroed, and the sight is not in the wrong place, then you can correct this problem back at the feed ramps. If, however, you find you have a non-“F” marked front sight housing, and you can’t easily zero your rifle, the correct solution is to change barrels. Or re-cut the ramps and also replace the front sight assembly. The process is, use a Dremel or similar tool with a narrow grinding tip or a carbide cutting tool. You can set it up in a mill if you are really, positively OCD and just have to. Or, you can do what every other gunsmith and armorer across the country does — hand-hold the Dremel, grinding the barrel extension to match the receiver ramps. That’s it; you cut the steel to match the aluminum. You can pull the barrel out of the receiver to do this. But the rest of us simply do the cutting or grinding with the barrel in the receiver. Once done, thoroughly hose out the grit with an aerosol cleaner, scrub the chamber, punch the bore with a solvent patch and then a dry patch, just to make sure you got all the grit. That said, Colt wasn’t entirely correct that it was just a problem with M4s and M855 ammo. The problem did happen in semi-auto rifles and carbines, and not just with M855. I had it happen to one of my Frankenguns, back when Colt was still working on the M4 details. That rifle would occasionally stub in feeding. I looked at it, figuring I’d just buy a new upper receiver if it came to that, and went to work. I had to cut complete ramps of the M4 type, in both the steel and aluminum (which is why I used a carbide cutter) and it worked just fine. It still does. But, when you order parts for your rifle to replace, rebuild or build from scratch, you want to pay attention to M4 ramps. Editor’s Note: This article is an excerpt from Gunsmithing the AR-15 — The Bench Manual. Mr. Sweeny, I am a big fan of your books and articles along with your writing style and unique no snobbery gunsmith prose. Channeling George C. Scott as George S. Patton in the movie “Patton”….Sweeny, you magnificent #@$%^&* I READ YOUR BOOK! The pull method is (or was) the “trained” method of the USMC and is depicted on p. 17-20 and p. 29 of “TM 05538C-10/1 U.S. Marine Corps Operator’s Manual w/Components List” dated June 1983. There may be newer versions of this manual but who knows…. C’MON MAN! where are the pictures? This is the 21st Century. Everything is digital including this article. The only people this article will make sense to is those of us who already understand the problems. I know you must have pictures of each combination. Add the pictures to the article and you have a solid foundation of an article. No pictures makes it way too difficult to “picture” in one’s mind. No pictures makes no sense in the 21st Century. No pictures in the 21st Century means it didn’t happen. The two photos have zero relationship to the content of this article proving my statement that it didn’t happen. Channeling another famous gruff character….SWEENEY! Pictures, where are the pictures? MOVE IT! MOVE IT! MOVE IT!